Melissa Espinoza Paez talks about medicinal plants at the Siwakabata agro-ecology farm in Talamanca, Costa Rica, May 10, 2018. To treat snake bites, bathe in a tea brewed from yellow button-shaped flowers, advises Melissa Espinoza Paez as she describes the medicinal properties of Costa Rica's jungle plants, pointing out towering vines used to combat kidney problems. In the lush mountains close to the Panama border that make up the Bribri indigenous territory, Espinoza hopes the country's first certified indigenous tour agency can deliver a bigger slice of income from ecotourism directly to local women. "When other agencies brought tourists to our territory, sometimes they'd give a small amount to the people here, but it wasn't really the value of their work," said Espinoza, 38, indicating a green dart frog trying to hide in the undergrowth. "We're giving a tourism experience that is truly cultural... We are trying to live a more dignified life," she said at the Siwakabata farm near Bribri town, some 220 km (140 miles) southeast of the capital San Jose. 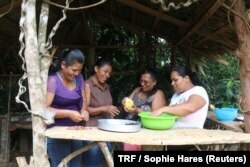 Melissa Espinoza Paez, her mother Nora Paez Mayorga, Basilia Jackson Jackson and her daughter Flor Dias Jackson, prepare cacao at the Siwakabata agro-ecology farm, Talamanca, Costa Rica, May 10, 2018. Home to dense jungles and cloud forests teeming with wildlife, Costa Rica has become one of the world's best-known ecotourism destinations. A quarter of its territory is now national parks or protected reserves. "The tourism sector in general is still learning how to deal with the social factors," said Saul Blanco Sosa, a sustainable tourism specialist with the Rainforest Alliance conservation group. "Dealing with people is more complicated than dealing with natural reserves." The World Travel & Tourism Council says about 13 percent of Costa Rica's gross domestic product comes from tourism, which is expected to employ 265,000 people directly and indirectly in 2018 to deal with its 3 million annual visitors. 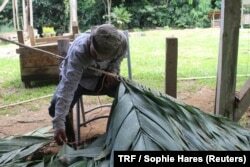 A man shows how to thread plant leaves onto a pole to make thatched roofing at the Siwakabata agro-ecology farm, Talamanca, Costa Rica, May 10, 2018. Tourists have long come inland from Costa Rica's Caribbean coast to explore the mountains, swim in waterfalls or float in long wooden canoes along the rivers lacing the Bribri territory. Guides from outside the area explaining the Bribri's spirituality and strong connection with nature usually just learn their spiel from a book or the internet, she added. "We live it, we feel it - but for the others, it's just about money," said Nora Paez Mayorga, who helps runs the 15-hectare (37-acre) Siwakabata agro-ecology project with her daughter Melissa. For many women living in Costa Rica's remote southeast corner with few formal qualifications, jobs other than raising chickens or growing crops such as plantain are hard to come by. Basilia Jackson Jackson grinds cacao beans at the Siwakabata agro-ecology farm, Talamanca, Costa Rica, May 10, 2018. 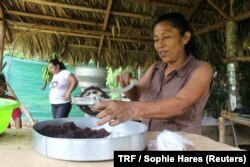 Growing bananas and cacao, her family's fortunes depend on the prices set by buyers, she explained, turning the wheel of a metal grinder. "We've never dealt with tourists, we're just getting involved with it... we could have a little bit more income - it wouldn't be much, but it would help the family," said Jackson, who traveled to Siwakabata with her daughter Flor. "In this area, we don't have much work. Between women, we've got to get organized to see how we can help each other." "As indigenous women from here, we know what we need. We can help each other to develop this project - valuing, maintaining and respecting our world view and our culture," said Espinoza.